Confection: 12 x 10ml vials. 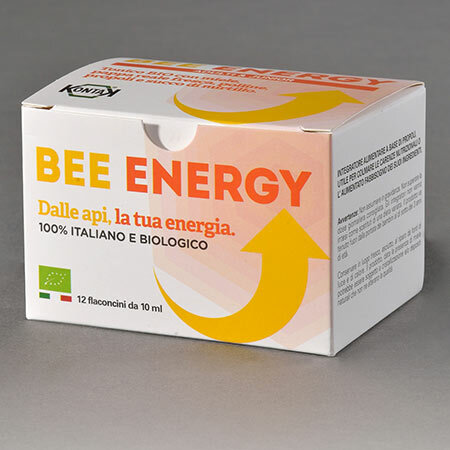 A natural food supplement with organic, Italian ingredients. Contains royal jelly, pollen, propolis, honey and blueberry juice - effective ingredients in the fight against physical and mental fatigue. BEE ENERGY TONIC helps to boost your energy levels in adults, children and adolescents, improving physical and mental performance and acting effectively against stress. Active ingredients: Fructose*, blueberry juice*, Italian honey*, alcohol-free propolis extract*, alcohol-free pollen extract*, royal jelly*, lemon juice*, rosmary essential oils*. Use: 10 ml per day, best consumed in the morning.